Within Teamwork Projects, you can quickly reassign tasks to other users. To do this, go to the Overview section of your project. To the bottom right of the screen you will then see the breakdown area. You can expand this by selection the Quick View option. This will then show the project users on the left side panel, when you click on a User it will show all of their assigned tasks on the right side. Here, you can reassign tasks by dragging them from the right side panel and dropping them on to a new assignee on the left. Note: You will need to click and hold the symbol to the left of the drop down option on the task to move it (as below). The reassigning is instant and you will see their active tasks increasing and their percentage of the tasks breakdown going up. 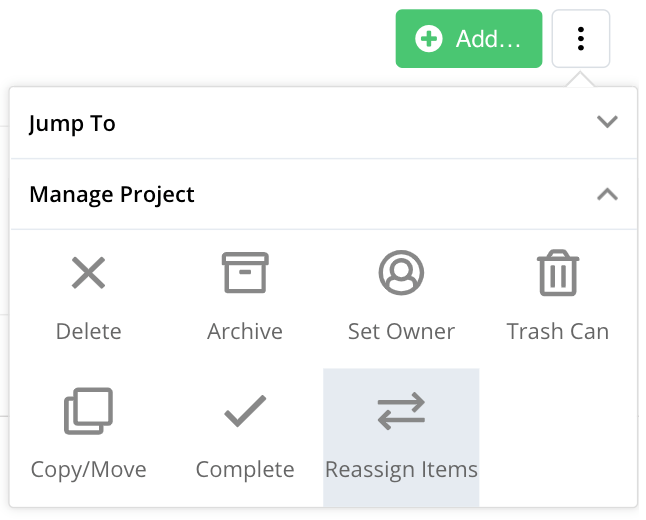 You can also bulk reassign all tasks on a project from within the Overview area. To do this, select the Options button (three dots) and select Reassign Items from the Manage Project tab. You will then be able to choose the user who's items you wish to reassign. Then choose what items you will reassign and who you will reassign them to.